Abstract: In the high-end videocard market, the Radeon X800 XL VPU offers great value. Even with 4x AA and 16x AF, the ATi X800 XL provides playable framerates in Doom 3 in High quality mode at 1024x768. Excellent. If you're looking for something faster than the mainstream videocards on the market but don't want to mortgage your house, the ATi Radeon X800 XL is exactly what the doctor ordered. Early third-party X800 XL videocards were going for as high as $500 CDN, but since ATi came to the market with its own X800 XL, prices have settled down. Now you can find some X800 XL's below ATi's MSRP of $399 CDN. The 3D performance of the ATi Radeon X800 XL was excellent. It scored well in every test we threw at it, even when AA and AF were involved. 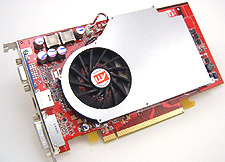 The card would routinely battle it out with the more expensive MSI GeForce 6800GT for second place, and when overclocked performed close to X800 XT levels. The extra hardware that accompanies the ATi Radeon X800 XL is useful. The card comes with everything necessary to connect the PC to a TV. We're disappointed that ATi does not include any sort of software bundle, but this has never been the companies strong suit. The ATi Radeon X800 XL is a great value king, and if you get your hands on one, you're going to be a very happy gamer!